The ultimate guide to every bone in your body. Did you know bones are 75% water? Or that humans and giraffes both have just seven vertebrae in their necks? Learn more amazing facts in The Skeleton Book. Full of incredible computer-generated 3-D images, children can explore the bones of the body in great detail. Find out how the skeleton is flexible enough to make the body agile but provides support and strength to the body. Bones are stronger than steel, gram for gram, but are five times lighter and ten times more elastic. The Skeleton Book works down from the skull to the toes so that each one of the 206 bones are fully explored. This book also uses comparison to animal skeletons to help kids understand more about their bones and show how the human skeleton is unique. Explore the future of skeletons through modern prosthetics and see how 3-D printing can help people with missing limbs. 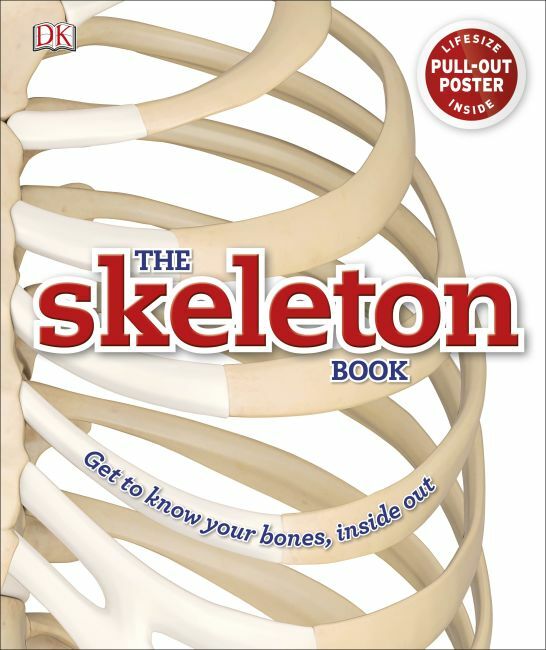 With an embossed cover and a pull out five-foot skeleton poster inside the book, The Skeleton Book gives perspective for kids to study a life-size version of the human skeleton.